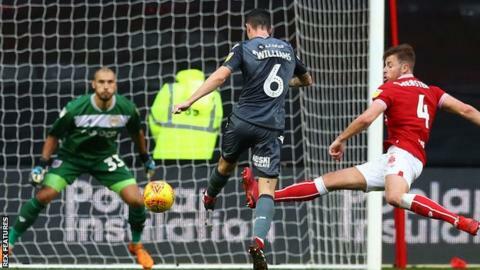 Millwall were unable to move out of the Championship relegation places despite rescuing a draw at Bristol City. Famara Diedhiou went close when his 28th-minute header hit the Millwall crossbar after Andreas Wiemann had flicked on a cross. City broke the deadlock as Niclas Eliasson's cross into the box was sliced into his own net by Jake Cooper. Shaun Williams secured a point for the visitors in a game of few clear-cut chances, volleying past Niki Maenpaa after Steve Morison brought down a high ball. Neil Harris' side are still without an away win since April and they stay in the relegation places on goal difference, while City remain 14th. Millwall did not threaten the Robins at all in the first half - Josh Brownhill and Lloyd Kelly both went close for the home side before Diedhiou hit the bar. The Lions' first effort came soon after the break as Aiden O'Brien forced a good low save from Maenpaa, while O'Brien was stretchered off shortly after City had taken the lead. Jed Wallace had a free-kick saved by Maenpaa as the struggling Londoners rallied as the half went on before they drew level through Williams. City almost won it in seven minutes of stoppage time - the impressive Eliasson sending in a corner which Eros Pisano headed just over the bar. "I was very, very pleased with many elements of the performance. I thought we got our identity back. "We passed, we moved, we got a lot of crosses into the box but I think it's obvious where we need to improve - the middle of the goal. "We're building a new group here and that'll continue in January. We've got a month until we get there, but in the meantime we'll get the best out of what's here. "I'm not displeased today. I feel sad that we didn't get the three points, but I thought we played with confidence, width and energy." "It wasn't pretty at times by us. We had to get back to being hard to beat, resolute, nasty and ugly at times. "I had to remind the players it didn't just happen for us last season. We've had up-and-down periods and we've not done the basics well enough at times. "The boys had to show resilience and character. We could easily have gone under at 1-0 down, but we found a way." Match ends, Bristol City 1, Millwall 1. Second Half ends, Bristol City 1, Millwall 1. Attempt missed. Eros Pisano (Bristol City) right footed shot from the centre of the box is close, but misses to the right. Assisted by Niclas Eliasson with a cross following a corner. Jordan Archer (Millwall) is shown the yellow card. Corner, Bristol City. Conceded by Shane Ferguson. Substitution, Millwall. Byron Webster replaces Steve Morison because of an injury. Substitution, Bristol City. Mohamed Eisa replaces Andreas Weimann. Delay in match Steve Morison (Millwall) because of an injury. Substitution, Bristol City. Marley Watkins replaces Famara Diedhiou. Substitution, Bristol City. Callum O'Dowda replaces Jamie Paterson. Attempt missed. Andreas Weimann (Bristol City) right footed shot from the right side of the box misses to the right. Assisted by Marlon Pack. Substitution, Millwall. Jem Karacan replaces Shaun Williams. Delay in match Shaun Williams (Millwall) because of an injury. Goal! Bristol City 1, Millwall 1. Shaun Williams (Millwall) left footed shot from the centre of the box to the bottom left corner. Assisted by Steve Morison with a headed pass. Niki Mäenpää (Bristol City) wins a free kick in the defensive half. Jiri Skalak (Millwall) wins a free kick in the attacking half. Shane Ferguson (Millwall) is shown the yellow card for a bad foul. Corner, Millwall. Conceded by Eros Pisano. Attempt blocked. Famara Diedhiou (Bristol City) right footed shot from outside the box is blocked. Assisted by Marlon Pack with a headed pass. Offside, Millwall. James Meredith tries a through ball, but Steve Morison is caught offside. Attempt missed. Andreas Weimann (Bristol City) header from the right side of the box misses to the left. Assisted by Niclas Eliasson with a cross. Substitution, Millwall. Jiri Skalak replaces Aiden O'Brien because of an injury.